In the 18 years I’ve been vegetarian (gosh is it that long? My vegetarianism could buy wine in a pub! ), I’ve been asked this question more times than I can count: What do vegetarians actually eat? Of course, if you’re veggie, you’ll know how ridiculous a question it is. It’s not like we just chomp on lettuce all day long (in fact I eat very little lettuce). Vegetarian options are almost limitless. But, for people who know nothing but the standard meat and two veg, vegetarianism can be a hard concept to understand. 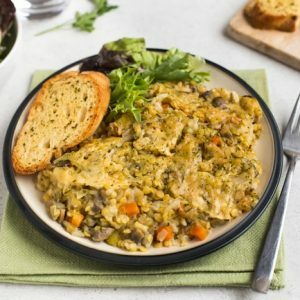 Hopefully these three posts will help people to understand that there’s so much more to vegetarianism than just rabbit food. And, I’m hoping they’ll also be useful to any vegetarians who may be in need of some new ideas. It’s so easy to get stuck in a rut, eating the same few things over and over again (especially when it comes to breakfast!) – so perhaps these posts will offer some new ideas or remind you of an old favourite. Some of the ideas below link to actual recipes, and others are just there for inspiration. So next time you’re asked whether you truly do survive just on cabbage and carrots, feel free to point people towards this post. 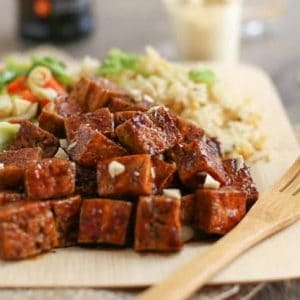 Hopefully it will help them to see just how many options we vegetarians have (and remember to come back soon for the lunch and dinner versions of this post)! 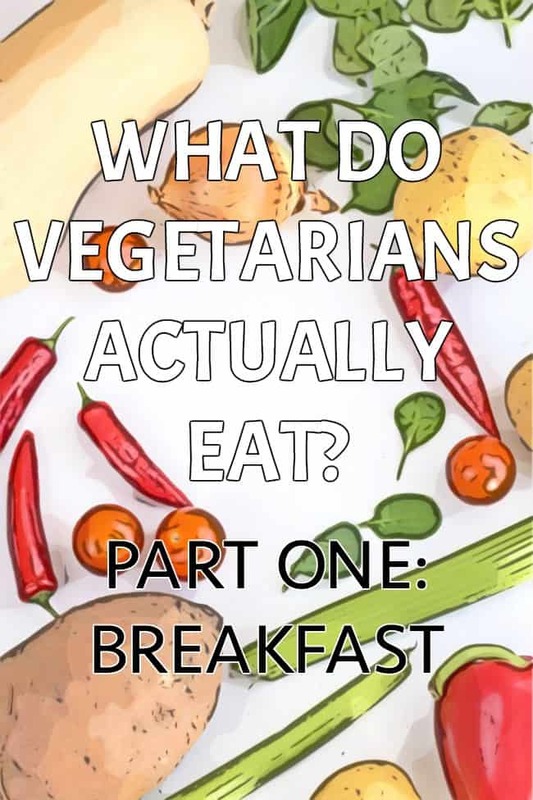 What do vegetarians actually eat for breakfast? – Porridge (oatmeal) with honey, jam, chocolate spread, or just a bit of brown sugar. 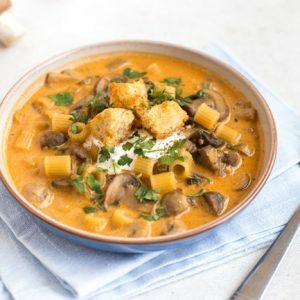 Can be cooked on the hob, or in the microwave if you’re in a rush – or, make your own instant version from scratch, which just needs hot water. – Yogurt with fresh or frozen fruit – my personal favourite are frozen blueberries. I also often sprinkle a few chia seeds over my yogurt. – Chia pudding – just mix some chia seeds with milk, and they swell up to give a pudding-like mixture. – Cottage cheese with honey and fruit – I’ve been obsessed with cottage cheese since January! It’s a great high-protein alternative to yogurt. – Smoothies – either a green smoothie or a plain fruit smoothie, made with milk or yogurt for protein. I also like to add a few oats for a heartier breakfast. – Cereal – I genuinely love Bran Flakes, but sometimes also have Weetabix or muesli. Usually with milk, sometimes with yogurt. – Veggie scramble – a variety of vegetables cooked into scrambled eggs or scrambled tofu. I like to serve mine on toast. – Frittata, filled with whatever veggies you fancy and baked until set. Cook it at the weekend and it will be great for the next few days’ breakfasts. 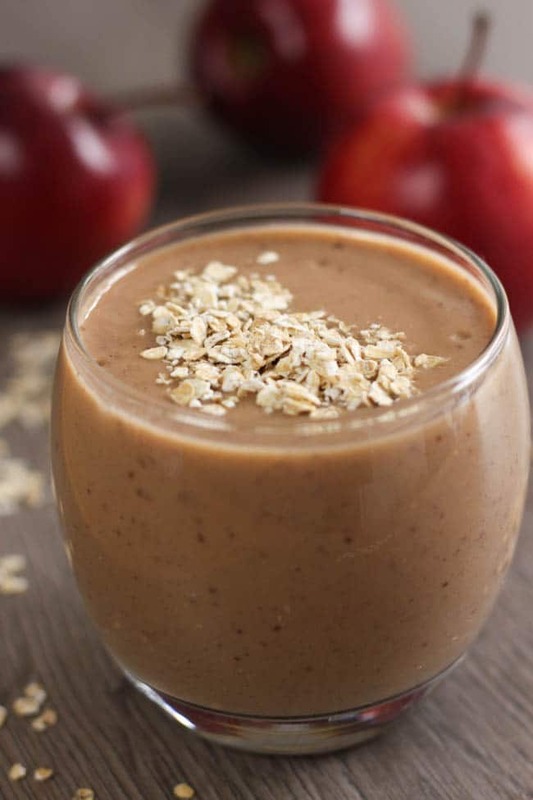 – Overnight oats – basically like cold porridge. 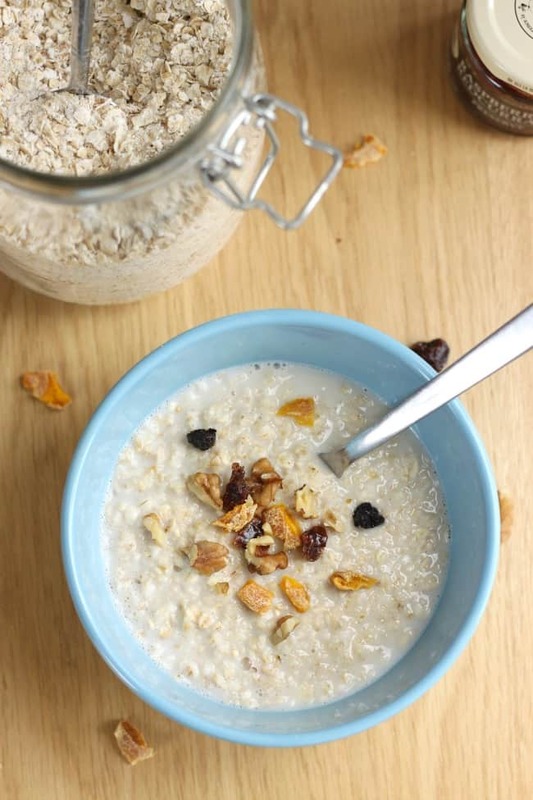 Just mix some oats with milk and flavourings the night before, and it’s ready by morning. – Beans on toast – proper British baked beans from a tin (like you can see in the photo below), not just any old beans! Or you can even make your own if you’re feeling fancy. 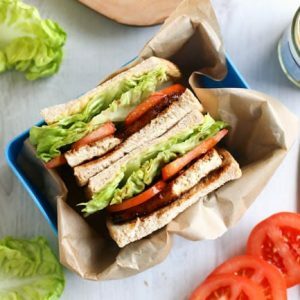 – Veggie bacon or veggie sausage sandwich – my personal favourite brands are Quorn and Cauldron, but most supermarkets do own brand stuff these days, so it’s worth trying a few kinds to find your favourite. 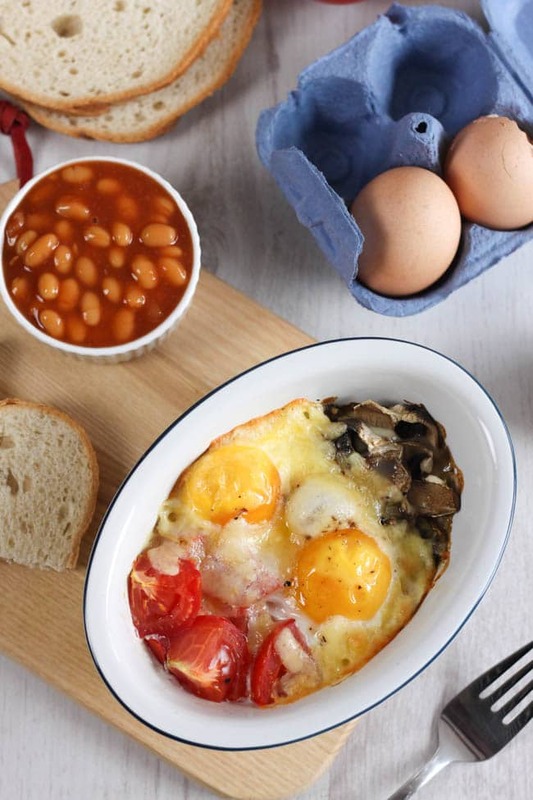 – Baked eggs – just crack an egg into a ramekin with whatever veggies or cheeses you fancy, and bake until the whites are set. Serve with toast for dipping! – Breakfast burrito – make a batch and keep them in the freezer! They’re really high in protein, so good if you have a busy day ahead. – Granola – great sprinkled over yogurt! – Avocado toast – especially topped with a fried egg. – Croissants, English muffins, crumpets, bagels, etc. – spread with butter and honey. 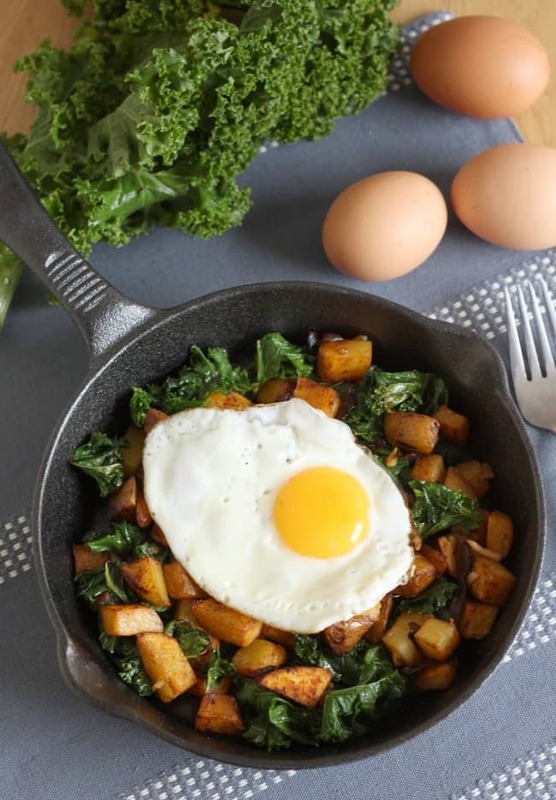 – Veggie hash – potatoes fried up with whatever veggies you like the look of, and finished off with a fried egg. What have I missed off the list? Feel free to offer up more inspiration in the comments! I’m not a vegetarian but I love vegetables. I eat meat because every time I tried not to, my blood tests weren’t very good. I actually never have meat for breakfast, and I’m one of those who never skip breakfast, I simply love it! So thanks for the ideas, my favorites are oatmeal or yoghurt with fruit. I’d love to try chia seeds, but I wonder what they taste like. A friend told me they tasted like soap (!) to her. Haha I’ve never thought they taste like soap! I’ve not tried chia pudding yet, but I do enjoy them sprinkled over yogurt or cereal. YES! I love this post SO much. People ask me all the time “what do you even eat? salads?” Today someone asked what kinds of sandwiches I can even eat. What kind of question is that!? Looking forward to this series! These all look so tasty!! I’m not vegetarian but don’t think meat at breakfast is necessary so would happily have any of these options in the morning. I’ve never had cottage cheese before but veggies seem to be obsessed with it so maybe I should.. I only discovered cottage cheese earlier this year but it’s quickly become a favourite :) If you like squeaky cheese you’ll probably like it! There are more choices on here that I thought I would have as a non-vegitarian! I will definitely be trying some of these out! Wow what a collection – I cannot believe that in this day and age, people are so uneducated to believe that vegetarians remain undernourished because of a lack of meat. 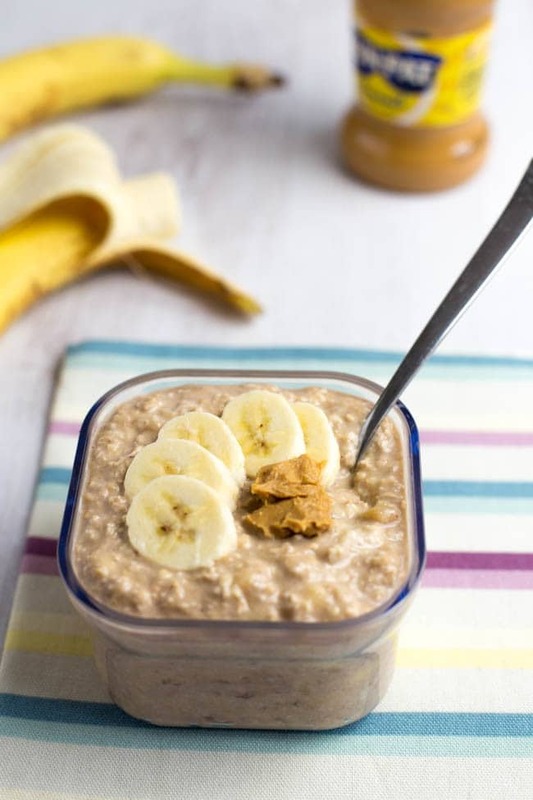 Overnight oats are my go to breakfast – veggie or not! Wow that’s made me hungry, I love vegi food. Salads are yummy if you know what you’re doing. I love this post! I’m also vegetarian and I’m always being asked what it is I eat or if I really do just eat salad all the time. I’m looking forward to reading the rest of your instalments! I get asked all the time what I eat as I have been a vegetarian for most of my life. I think it has become much easier over the years particularly when going to a restaurant as so many have added veggie options to their menus. Breakfast is always difficult , I do not eat eggs and don’t really care for breakfast food so I usually just have some fruit and some almonds or an english muffin with peanut or almond butter. I love weird nut butters. I had some hemp seed butter recently that was amazing! Great feature, and so many delicious breakfast ideas. I find breakfast the easiest meal to be veggie, as so many breakfasts are veggie anyway. Looking forward to the breakfast and dinner posts. 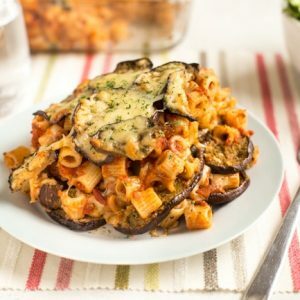 Such a gorgeous collection of recipes! Vegetarian foods don’t need to be dull, as you illustrate regularly! yum! Vegetarians really have some delicious breakfast options. I’ve considered going vegetarian before. I’d probably start off on a meal plan. I’ve been veggie for 4 months now and I always eat avocado and tomato on toast when I eat breakfast! Great list, I will have to try chia pudding! I’m finding it quite easy :) There’s so many different meat alternatives and veggie options which is so helpful! Yes to be honest I do skip breakfast more often than I should, it’s my least favourite meal of the day so I sometimes prefer to wait til lunch. Bad habit though! That veggie hash looks delicious! I’m not vegetarian and yet that was basically a list of everything I eat for breakfast! Although there’s some great healthy breakfast inspiration in this post that I’d love to try! OMG AVOCADO TOAST IS SO GOOD NOM NOM. It makes me laugh when people ask me what I eat as if being a vegetarian means that you have no choices when it comes to food lol! This is such a good post. I’ve been vegetarian for 11 years and I always get asked what I have to eat. For breakfast I usually have granola or if i’m busy wholemeal toast and jam! I find a vegetarian breakfast easy enough – it’s what I usually have! An egg of some kind with a piece of toast, cream cheese and Marmite (or Boursin cheese with black pepper), and another slice of toast with jam or marmalade (if honey, then also with butter). But I do find a vegan breakfast – on the occasional day I try to be completely vegan – quite difficult, and usually end up with either baked beans on toast or a peanut butter and banana sandwich. I expect they are, if I actually liked cereal enough to bother! Which I don’t…. home-made muesli, at a pinch, but really that is all. I think having a vegetarian breakfast is really easy, there are so many options out there, I couldn’t think of anything else. Great collection of ideas! Actually, when it’s a hot summer morning, I enjoy cold pizza in the morning, whether carry out or my own veggie pizza. If it is fall or winter, I will sometimes take the edge off temp wise. I recently enjoyed a shashuka for breakfast. Used the traditional tomato base, but there are so many colorful options. Unfortunately, my wife would not join me. ? That’s a shame, sounds delicious! Great post!! Such wonderful ideas. Can we add the decadent breakfast choices? 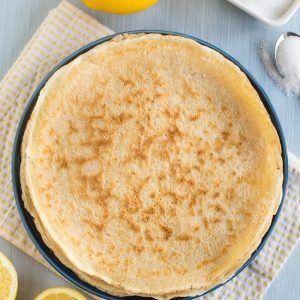 Pancakes, waffles, sweet rolls, potato latkes…yum! I’m not actully a true vegetarian (I just prefer veggie food ?) and it shocks me that people can be so silly to ask that ?. Anyway, onto breakfast. You’ve got my fave two up first (porridge and yogurt), they are also great together. I also find it fun to experiment with breakfast foods from other cultures. I sometimes grab breakfast at a Taiwanese place and they have some amazing vegetarian options, mainly street foods and the all important bowls of fresh hot soy milk (so much better than the store brought stuff). Fantastic post! 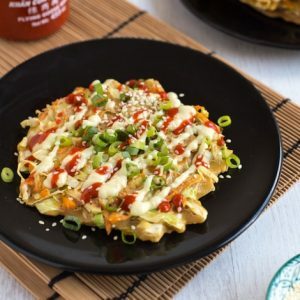 There are countless number of delicious vegetarian recipes and meal combinations and you’ve proved that time and time again :) Love all these breakfast ideas! What a fab post – looking forward to reading about lunch and dinner! Those baked eggs look super tasty. I’m hungry now!! Gahhhh! What a lot of yummy breakfasts!!!! I love baked eggs but haven’t made them for AGES. I’d never though of having cottage cheese for breakfast either… i’ve rekindled my love of it piled up on toasted sandwich thins with soup, but may have to try it to start my day. Breakfast is my fave meal of the day!